Members of an East San Jose community came together Sunday and called for the restoration of a mural that was recently painted over. The mural depicting Latino historical figures was completed in November 1985, and more than three decades later on Mexican Independence Day, dozens of people gathered in the parking lot off Story Road that’s become a flashpoint for the community. A mural that was part of an East San Jose community for more than 30 years was painted last month. It was a poignant day as activists such as Jose Valle spoke near the wall where the beloved Mural de la Raza once stood. It was recently painted over, causing outrage, and it’s still unclear who removed it. 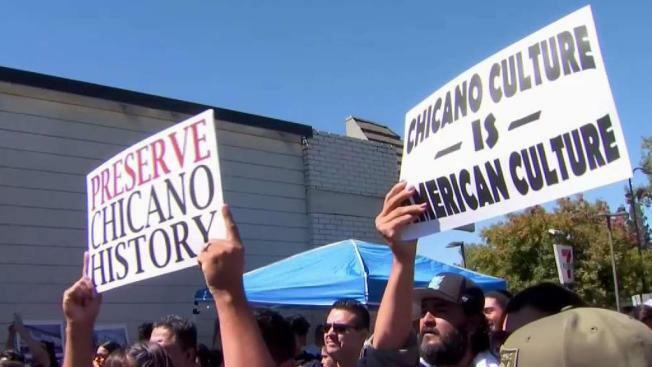 Members of the community signed a document addressed to the building owners and the city of San Jose, demanding change, including restoration of the mural. "We want equitable funding and resources to help maintain, restore and paint more murals, more Chicano murals in San Jose," Valle said. Artist Jose Meza Velasquez designed and painted the mural on the wall of the former Payless Shoe Source. "I want to say thank you to the community because it’s a big surprise for me," Velasquez said. "The community, they’re telling us to restore it. I don’t know if we can, because we need permission." Organizers say they have received support from the city, and they have sent a clear message: That piece of history must be protected. "We have a long road ahead," Valle said.